Last week, PTSB bank bosses confirmed that the ‘special purpose vehicle’ which more than 6,000 of its mortgages have been transferred to will be exempt from tax. PTSB boss Jeremy Masding before the committee next week. TAOISEACH LEO VARADKAR said a loophole which allows a €1.3 billion mortgage ‘vehicle’ from paying tax will be closed if the government can do so. 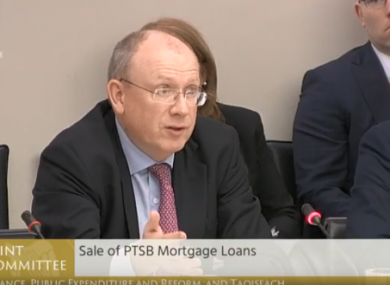 Chief executive of PTSB, Jeremy Masding, appeared before the Oireachtas Finance Committee, along with other executives from his bank and from Pepper in Ireland. Two weeks ago, the bank said it had come to a ‘securitisation agreement’ to move these loans to a special purpose vehicle which will be financed on the bond markets. The gross value of the bundle in what has been dubbed Project Glenbeigh is €1.3 billion. Last week, Sinn Féin’s Pearse Doherty questioned the bankers and forced them to confirm that the set-up of the vehicle, also known as a Section 110 company, will operate tax-free. The Oireachtas legislated to close loopholes that had allowed vulture funds to avoid paying tax. The issue was raised by Doherty in the Dáil today. “Permanent TSB is in the process of selling €1.3 billion worth of mortgage loans to a vulture fund, Glenbeigh Securities. No one knows who owns the fund. It is completely secret having only been established one month ago. “A key issue is that this is now tax free as it is a section 110 company with charitable status. Despite the fact that we closed the loophole in the Finance Acts 2016 and 2017, the fund is telling its investors it has found a way around it because Permanent TSB holds a small portion of the economic interest,” he said. He asked the Taoiseach to bring forward emergency legislation to close the loophole which a company holding €1.3 billion of Irish property has found a way around. The Taoiseach’s party colleague, Bernard Durkan also raised concerns about the sale, adding that the Central Bank (Consolidation) Bill might be able to address the issue which he said involves a number of other vulture funds “operating with consequences for our constituents nationally”. Email “Taoiseach vows to close loophole that allows €1.3bn mortgage 'vehicle' not to pay tax”. Feedback on “Taoiseach vows to close loophole that allows €1.3bn mortgage 'vehicle' not to pay tax”.